Well known for being high in vitamin C, grapefruit also has significant amounts of vitimin A and potassium as well as a number of other trace elements. Vitimin C is a powerful antioxidant and among other things also helps us to absorb iron into our bodies. Vitamin A is another strong antioxidant and is good for immune health and potassium plays an important part in keeping our cardiovascular system fighting fit. Smoothies are one of our breakfast staples and since acquiring my wonderful high speed blender, they have overtaken our sourdough rye toast in popularity. Until I was contacted by Florida Grapefruit, I had not thought of including this particular fruit in a smoothie. Along with a goodie bag of grapefruit inspired items and a voucher to buy some ingredients, I was also sent some drink recipes to try. Red Sunshine Shake and Grapefruit Heaven both sounded delicious and I expect I will give them a whirl one of these sunshiny days, but it was my morning smoothie I was most interested in. The recipe for Sunshine Grapefruit Smoothie used yoghurt, but as we seem to produce copious amounts of kefir, I used that instead. The weather was balmy with not a cloud to be seen, but it’s still a little too early in the year for me to want ice-cold drinks for breakfast, so I omitted the ice from the smoothie and used an unfrozen banana. The recipe below is the original but the result of my salmon pink version was pure delight. Delicious, smooth and refreshing and not a bit of grapefruit skin to be found. 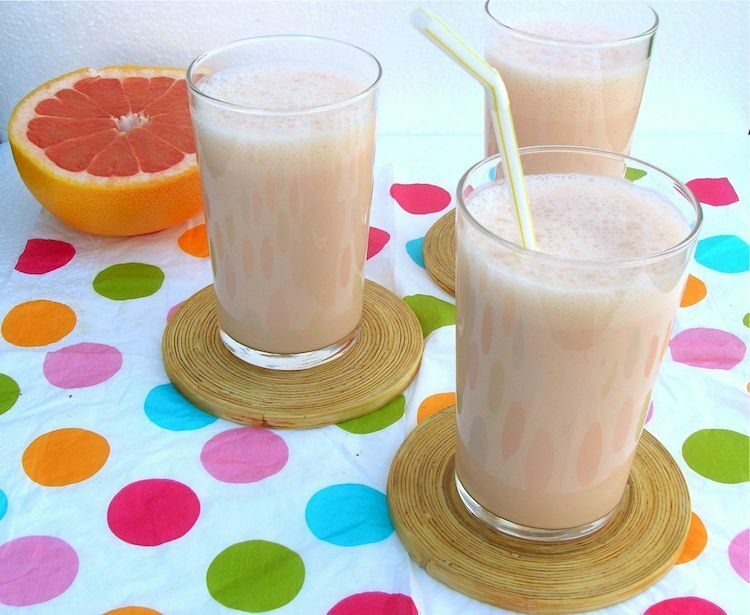 A refreshing salmon pink smoothie that energises and gets you dreaming about sunshine. Cut the grapefruits in half horizontally, and cut the flesh from the skin with a grapefruit knife. Put the Florida grapefruit parts in the blender. Now, peel the skin from the frozen banana with a peeler, cut the banana into pieces and, together with the yoghurt, add it to the grapefruit in the blender. Start the blender and let everything purée, add 4 ice cubes and the oatmeal and blend again until the ice has been crushed. Serve straight away in tall glasses. It is delicious and a really great start to the morning Louise. Oh please do Stephanie, it’s a good one. My mouth is watering Choclette! I’d never thought of adding citrus to kefir before Jac, but it’s a surprisingly good combination. Thanks Camilla, it is really good and a great one for warmer days too. This sounds delicious. I’ve been trying to introduce smoothies as a breakfast option, so will definitely suggest this one. Yum! I reckon it would be good place to start for those who are a bit dubious about grapefruit Helen. Now this is the sort of breakfast I would love to wake up to. You know I really like grapefruit but somehow forget to but some. Yep, a great one for spring and summer in particular I reckon Bintu. Sounds delicious. Don’t eat grapefruit really but in a smoothie and with banana. Hello! It’s a surprisingly good combination Josie and not one I’d have thought of. 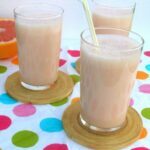 I love grapefruit but I have never tried it with banana in a smoothie,Interesting combination. It wasn’t a combination I’d come across before Nayna, but it was a really good one. It’s a really nice summer smoothie and well worth a try.